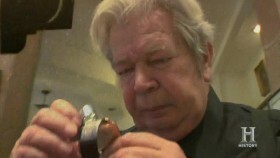 The Pawn Stars have an opportunity to buy a huge gold bar believed to be from a 1500s shipwreck. Will the gang dig in and strike it rich or will they end up on a fool's errand? Then Rick has a chance to shoot for the moon with a celestial navigation dome from a World War II B29 bomber. Will his offer take flight or come crashing down? And later, a woman brings a mint condition collection of golden era American League baseball field passes. Can Rick hit the deal out of the ballpark, or will he strike out looking?